About two week before my brother’s wedding, Scorch noticed he had 3 loose teeth- his top two, and one on the bottom. I kid you not when I tell you that I prayed that the boy’s top teeth would stay put until after the wedding. Thankfully, they did so we don’t have a jack-o-lantern grinning at us from all the pictures. But the inevitable did happen and he lost one of the top teeth today (the bottom one came out the day before the wedding). 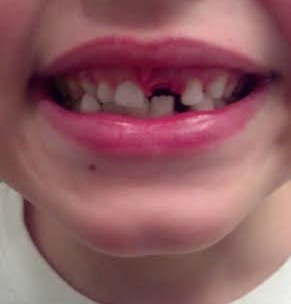 I admit, as dumb as it sounds, losing his top tooth got me today. When a little kid loses his top teeth, they lose that little kid look. Before long, Scorch is going to have these gigantic teeth that the rest of this face is going to have to grow into, with gangly arms and legs that go on for miles. The next thing I know, he won’t want to kiss me goodnight, he’ll never ask to cuddle again and he’ll move across country and leave me forever. Who knew one little tooth could cause all this angst? I keep reminding myself that I’m going to love the kid, then the man, that Scorch grows into just as much as I love the little boy he is today- I just wish he’d stop growing so fast. Someone come up with a cure for that, ok?